We offer regular Sunday morning sessions for all school-aged children. All Stars meet upstairs in the hall and Comets meet downstairs in the Blue Room. They are led by at least two DBS-cleared adults, and offer an engaging, age-appropriate look at Jesus, the Bible and Christian life. We follow a syllabus offered by Urban Saints, Freedom in Christ, and Scripture Union. We aim to be relaxed and friendly; everyone is welcome, even if only visiting for a short time. Once a month, or on special occasions, we stretch the age range of All Stars to include pre-school children- these sessions are shown on the rota. We are happy for parents to stay with their children, if they would prefer. All children begin the morning service in church with their families, then leave after a couple of hymns and a children’s address. For children who are pre-school age, there are activity and toy sacks available. There is also a small table at the front of church, where younger children can play, so that the whole family can remain in church during the service. We want all families to feel welcome at Richmond Methodist Church, and able to participate as much or as little as they wish. Feel free to talk to any of the team if you have question about how it all works. I am the Schools and Families Worker for the circuit, based in Richmond. In this exciting role I am hoping to support existing projects and start some new initiatives. I link with local schools, particularly Richmond Methodist School. I work with the fantastic volunteers at junior church, at youth groups and community groups. 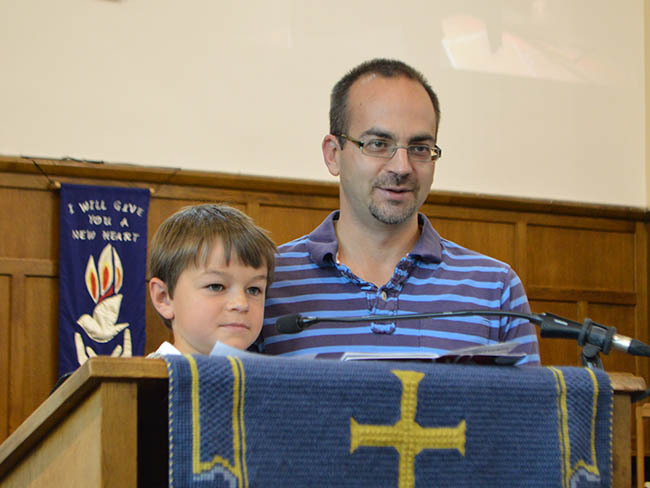 I was brought up in the Midlands and lived in various places before settling in Richmond just over 10 years ago, attending Methodist Churches throughout my life. I am married with two children and a rather crazy dog. I am training to become a local preacher; hard work but I'm thoroughly enjoying it. If I get any spare time I enjoy cooking, baking and curling up with a good book. The role of Schools and Families Worker is very close to my heart and I want it to be service and witness to the whole community. So, if you have any ideas, please do get in touch, all suggestions considered!